In this era where the world constantly demands for the new and the unique, how will this generation’s budding designers bring forth fresh concepts that set the bar for the future of fashion and would hold the fort? Sinulid, the annual culminating show of the Fashion Design and Merchandising Program graduating students of the De La Salle-College of Saint Benilde, is set to gather both experts and mavericks in the industry to witness the vast design possibilities produced by today’s passionate and aspiring style hopefuls. Equipped with the knowledge and skills garnered from renowned designer Lulu Tan-Gan and Fashion Merchandiser and Program Chairperson Christine Bennet, a total of 93 student-artists will encapsulate three years of exceptional guidance and nurtured training into ten months of creative process in preparation for Sinulid’s third – and biggest ever. Themed Stories Unraveled, this year’s presentation will unveil not only new trendsetting ideas, but also garments that will speak of advocacies on femininity, mental health awareness, sustainability, and sexuality. Likewise to be highlighted will be looks that depict the wonders of heritage, structural architecture, mutation, singularity, luxe, playfulness, and a seamless fusion of Philippine textile and contemporary fashion directions from the capital cities of the world. On Thursday, August 2, 2018, the long runway set up in the midst of SM Aura’s Samsung Hall will stage 171 head-turning creations, ranging from ready-to-wear, avant-garde, bespoke pieces, and evening long gowns. The SM Atrium on the Ground Floor will likewise be decked and dressed with 159 original and distinct garments, most of which are gearing up for future brand openings. “This year, we are once again blessed with talented, diverse and hardworking artists,” Benet shared. “They successfully encountered a rigorous design process that began by identifying their design aesthetics and career aspirations. 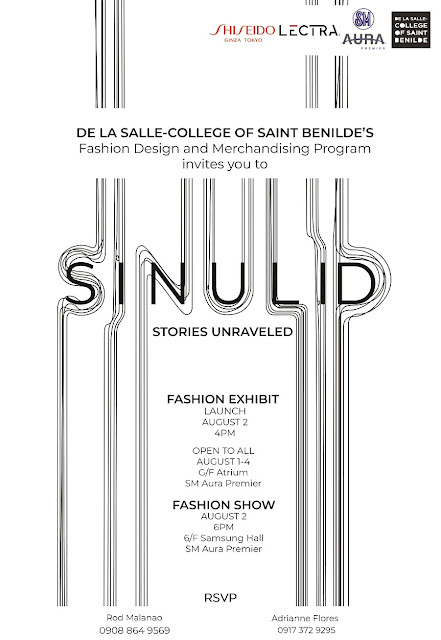 Through Sinulid, they will showcase their works on different platforms that best suits them, allowing them to widen their horizon of opportunities in the fashion industry: may it be through Design, Merchandising, or Styling,” she added.